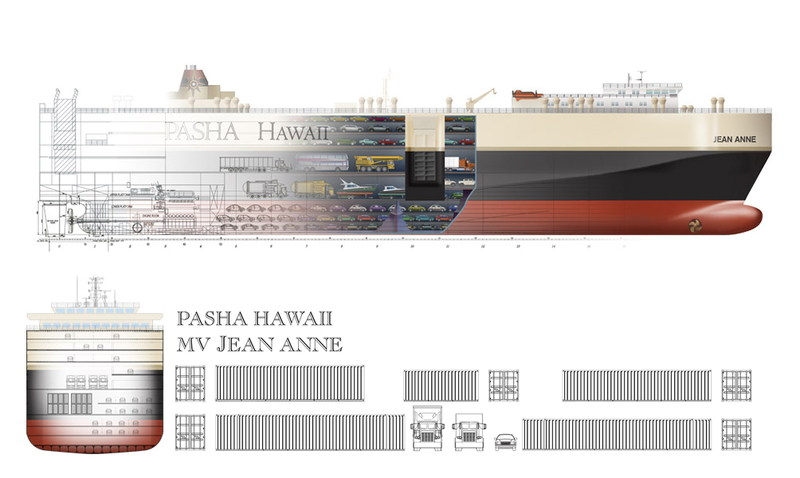 Launched in 2005, the M/V Jean Anne is the first fully enclosed roll-on/roll-off ("Ro/Ro") ship or pure car/truck carrier ("PCTC") to serve Hawaii from the Mainland, and the first-ever modern PCTC built in a U.S. shipyard. The Jean Anne was constructed in response to the desires of our automotive customers who recognize the PCTC for its efficiency and low damage ratios. The modern PCTC is the mode of ocean transport that delivers your cargo damage free with no exposure to tight container doorways or ocean salt spray. Number of fully enclosed ventilated decks: 10, 3 of which are designed to carry heavy and oversize construction equipment, agricultural, and military equipment. The Jean Anne's design allows maximum flexibility for carrying a wide variety of cargoes, wheeled or static, driven onboard or loaded with heavy-duty vessel trailers and forklifts. Decks 4, 6 and 8 are reinforced for heavy oversize cargo, containers and static pieces, and are able to accommodate 125,000 sq. ft. of cargo.